Vasanth Kannabiran’s book offers a rich and rewarding reading experience. The writer intended each of the five pieces to be ‘shaped into music and dance’, in order to be performed as ballets in the Bharatanatyam tradition. But they also merit their own rightful place as works of literature. 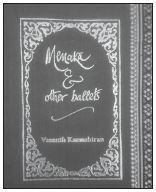 There are five ballets in this volume: ‘Menaka’, ‘Peace on Earth’, ‘Ahalya’, ‘Gandhari’, and ‘Rajasimha’. As can be expected, ‘Menaka’, ‘Ahalya’, and ‘Gandhari’ are based on mythological characters. All three ballets retell the stories of these figures—familiar to many—with a shift in the point-of-view, endowing each of these famed female characters with their own individual voices. ‘Peace on Earth’ presents Esther, Mary Magdella, Rabia of Basra, and Akka Mahadevi to ‘connect and celebrate the unity and diversity of faith’. This ballet ends with a call for peace upon our earth. ‘Rajasimha’ ‘evokes the avatar of Narasimha as a metaphor of liberation’. How this representation finds its development from the violence of destruction to revival of life is the key element of this story. In the underlying mythological story, goddess Lakshmi, reincarnated as a tribal child Chenchu Lakshmi, subdues Narasimha’s rage and puts an end to his rampage. Chenchu Lakshmi can be seen as a personification of nature with all its inherent wealth (in contrast to Goddess Lakshmi, who is conventionally identified with the glitter of prosperity). Kannabiran is a consummate storyteller. For those of us who find it difficult to connect the dots related to the genesis of celestial beings that populate our ancient Indian myths, her retelling of stories from these myths is easy to follow. She is able to provide background stories and revive our memory of those labyrinthine connections with a light touch. For example, her Sutradhari in ‘Menaka’ is as brisk as she is precise, and quickly recaps the complex conception stories of many characters who are mentioned in it. So we know Dushyanta begot Bharata, who was helped along by Brihaspathi to have an heir in Vitatha. There are several other instances where such help is very handy, as in the story of Gandhari and Kunti’s offspring. A word about the voice of the characters themselves. In retelling familiar stories, Kannabiran’s technique of creating a fresh point-of-view and articulating it in a hitherto unheard voice works to great effect. Ahalya’s voice is, as to be expected, weighed down by grief, but it is also surprisingly sensual. She speaks of the number of times ‘this heart of mine turned to stone’, when she describes her role as the austere sage Gautama’s virtuous wife; she also speaks of her heart rising to ‘peaks of delight’ when the ‘heat and passion of Indra engulfed’ her. Gandhari’s voice is equally complex and fresh. Her great distress at the ‘stripping of golden-limbed Draupadi’ and her knowledge that this wrong would have to be avenged is followed by the subsequent torment of a ‘mother’s grief and rage’ when her sons are killed violently. Those dramatic moments that explore issues of ethical and moral integrity are aspects of Gandhari’s tragic character I haven’t seen explored elsewhere in imaginative literature. Gandhari’s self-imposed blindness as a metaphor that amplifies her voice is moving and troubling. It is superbly crafted to ask women if we can really refuse to acknowledge horrors we see around us, and why many amongst us choose blindness in order to conform to conventional respectability. Akka Mahadevi’s voice in ‘Peace on Earth’ is suffused with imagery that is wholly in harmony with her world. Her world is as mystical as it is natural. The recurring images of the white jasmine flower, of the rain falling on the parched earth, and of the naked form of Mahadevi herself, evoke our senses. Her words thus become things of experience rather than abstractions of the intellect. This immediacy is present in the voices of Ahalya, Menaka, and Gandhari, the eponymous protagonists of the other three ballets. Only the final piece, ‘Rajasimha’, is told entirely by narrators, and doesn’t present a protagonist’s voice. It is difficult not to be moved by the reversal of a familiar image here in the words Rabia speaks —that of putting out the flames of hell and setting fire to heaven—an image that subverts a clichéd and almost institutionalized belief about good and evil. Many wonderful and evocative images and phrases in Akka Mahadevi’s story are attributable to Akka herself, which we read here in Kannabiran’s sensitive translation. Kannabiran’s protagonists, all of them women, all of them famous mythological characters from famous stories, and, in a few cases, even historical figures, emerge with their own individual voices in her ballets. They all speak of things longed for—freedom, peace, and selfhood. I have heard of Menaka as the celestial seductress, but here she declares: ‘There was no seduction.’ She asserts here that she was the test and Viswamitra failed the test. Her presence, her femininity, was all that it took for the sage’s harsh penance to be derailed. All the stories have to be examined in terms of whose story it is and who tells it. The narrative perspective in these ballets undergoes a fundamental alteration, but without stridency. These retellings are poignant; they stand as proof of an enforced or habitual blindness, a deafness, a muteness. The five ballets in Kannabiran’s slim collection are obviously designed to be performed, as evidenced by the success they have enjoyed on more than one stage. Beyond that, the text of the ballets is rich and layered, well worth reading in solitude or in a theatrical reading group. There is lyricism and inherent drama in each of the pieces. The narration is well balanced with varying moods and tells stories of love, betrayal, longing, and a misplaced sense of loyalty and honour. The stories, with their moving and memorable images, release their female protagonists from behind the curtained recesses of the theatre and give them their rightful place—center stage. On a purely personal note, when I first began to read these ballets, I was struck by Kannabiran’s uniformly engaging and original approach to familiar stories and her aesthetically appealing narrative technique, where she incorporates lyrical narration with experiential insights. Menaka’s assertion that ‘In every act of aggression … lies the seed of change’ thrilled me. So did the superbly voiced tragic lament in ‘Gandhari’, which left the sound of keening ringing in my ears long after I had finished reading the ballet. For me, Ahalya was the very personification of women ‘hunted’ in the name of virtue. I thought about how one story often is everyone’s story and how who tells it is of preeminent significance to lay bare the relevance of it to our lives. It would be logical for Kannabiran to take her work forward and perhaps present Kannagi and Madhavi, Meera Bai, Savithri, Rani Lakshmi Bai, and many others like them to fill empty stages waiting to come alive. Kamakshi Balasubramanian is an educator with over 40 years of experience and an occasional writer.